This was the year of the 18 pounders on the Clearwater River. We had slugs of steelhead that big this season. I see them this big every year, but seeing them this large and in this many numbers, it’s been a long time. It hasn’t been this good for large fish in almost a decade. Overall, considering in preseason they were predicting reduced bag limits, it’s been a great year. It’s been above average. We’ve caught a lot of big fish. Why are we seeing so many large fish this year? There’s a ton of factors that can play into it. However, these are fish that stayed an extra year in the ocean. All the big fish we get are wild. None of them are hatchery fish. But, let’s give credit where it’s due. You wouldn’t believe the spawning grounds these fish have in the inner most part of Idaho. The places they’ve set aside for spawning are immaculate pieces of water (the Lochsa, Selway, Red River and American River). Idaho set these aside for spawning and has done a good job at managing this and creating a clean, pristine place for these fish to spawn. Fishing has been good since October. However, the season will start to slow down in mid March. Right now we’re putting about 10 fish in the boat on a normal day, but same days we have 15. Keep in mind, there’s still a lot of fish around that are heading up four or five systems to spawn. There’s A and B-Run fish, but the average size is about 10 pounds. Most of our hatchery fish have passed us. We are catching piles of wild fish. 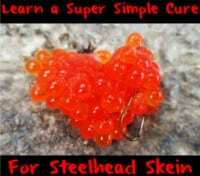 The steelhead we are seeing now is a run of fish I call the C Run. Those are the late run fish that are sort of held up by the dams when the ladders close for cleaning in the winter. Now that those ladders are open we are starting to see those fish. These are hard fighting, long running, solid fish, but most all are wild. In early season, basically, October and November, almost every fish we have is net marked, which means they’ve been tangled in the nets way downriver. Fortunately, this time of year there are no nets. Therefore, we get clean fish that aren’t marked at all. It’s nice to see. These fish look great. The lower river is starting to produce less and less and the upper river is starting produce more and more. I’m going to be hanging around Orofino, Idaho, most notably the Dworshak Hatchery, which is the largest steelhead hatchery in the world. The steelhead are everywhere. I can’t pinpoint an area they are in. Today, I caught them in six-foot and 30-foot of water. There’s a lot of fish around and they are moving through the system. They are taking the path of the least resistance. They aren’t in the heavy current. Anywhere there’s a current break there will most likely be a steelhead. Any type of rip line or back eddy there will be one. Any place they are able to duck in and rest. Last month I was using a lot of shrimp. However, now it’s an egg show. We’re drifting yarn ball combos with Pink BorX O Fire cured eggs and also pegged Corkies. I’m using larger pieces or roe, about the size of a nickel or quarter because the water is a little murky. When it comes to line, 12-pound Suffix Siege has been standard with a No. 4 Gamataksu Big River hook. Editor’s Note: Toby Wyatt operates Reel Time Fishing. 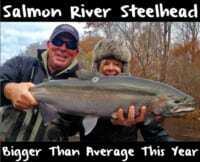 For more info on his guided Clearwater River steelhead trips please visit www.reeltimefishing.com.